When we first moved from the U.S. to South Africa in August 2008, just a little over four years ago, I wondered about breakfast, “is that all there is?” And, “Pork and beans for breakfast? REALLY?” That is when I really realized we ARE that different. And, yes, you have us figured all wrong. Let’s take for instance the Mugg & Bean “American” Breakfast: Two fried eggs, back bacon, beef sausage, Boston beans, grilled tomato, M&B chunky fries with a slice of M&B toast. As a rule, we do not eat beans for breakfast. (I am sure my nutritionist would think beans were a great idea for breakfast.) But, we just don’t do it. Maybe a few beans in a breakfast burrito on some food truck outside an office building somewhere, maybe. But that would be rare: I am almost certain of it. And, literally, only one slice of toast??? There are two slots in a toaster??? You are supposed to get two slices. We only have one type of bacon and that is what you call streaky bacon. In the States, we don’t have back bacon or shoulder bacon for that matter. Ok, and one last thing, does anyone actually eat the grilled tomato or is just a garnish? How about one fried egg, three slices streaky bacon, and a tall stack of light and fluffy pancakes, with a slathering of butter and real maple syrup? Yeah, I like the sound of that! You may wonder why I am not calling these lemon pancakes. When in fact I adapted this recipe from a lemon blueberry pancake recipe. I the ditched the blueberries a long time ago. Store bought blue berries are really too big, I think. They tend to explode during cooking and just don’t help the texture. I do however, leave in the lemon. I think the tartness of lemon compliments the saltiness of the butter slathered on top and the rich sweetness of the maple syrup bath. Zest Lemon directly into a large mixing bowl. Only make one pass with the zester in any one spot. You only want the yellow part, you don’t want the biter white flesh under the skin. Juice lemon. 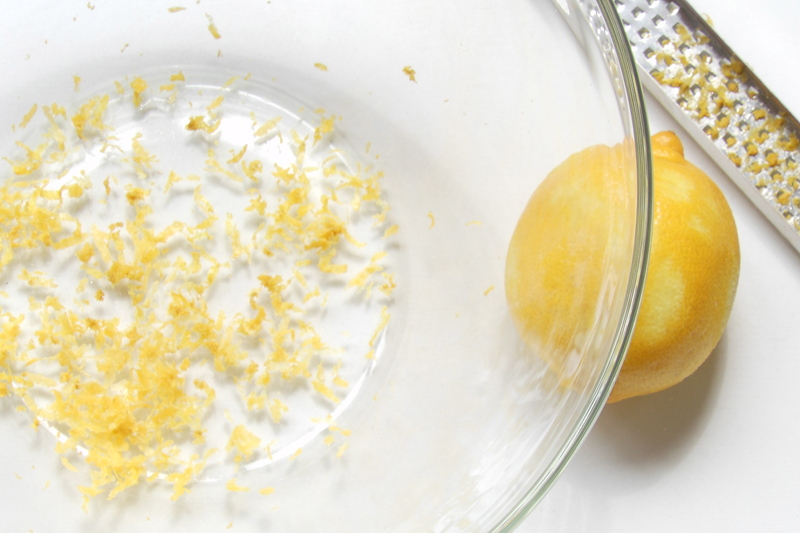 If you put the lemon in the micro for 30 – 60 seconds, the lemon will be a lot juicier. Just be careful. The juice may be hot and it may splatter when you cut into he lemon. Add the milk, lemon juice, egg and butter into at least a 500 ml (2 cup) measuring cup. Add the vanilla and give it a good stir with a fork or whisk. Set aside. Add the dry ingredients to the bowl with the lemon zest. And give it a good mix to fully incorporate dry ingredients. (Salt not pictured.) Set aside. Pour liquid ingredients into dry ingredients. 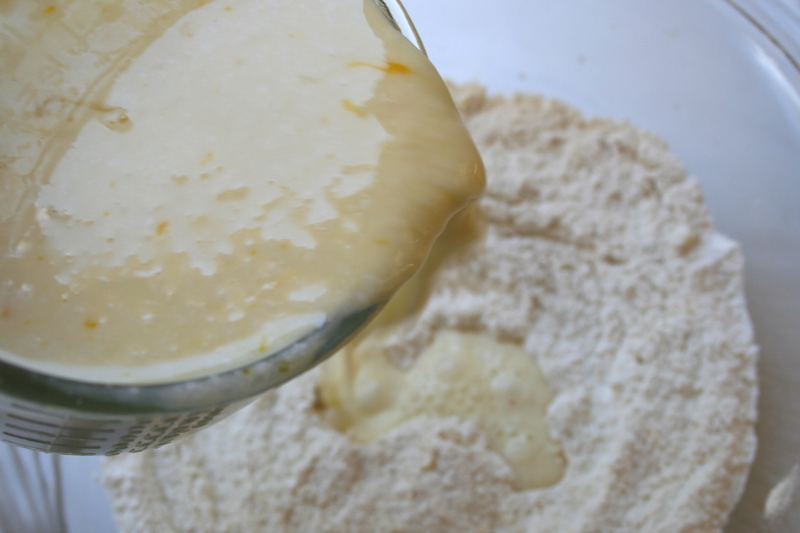 Gently fold the liquid ingredients into the dry ingredients, taking care not to over mix. The batter should be fairly lumpy. 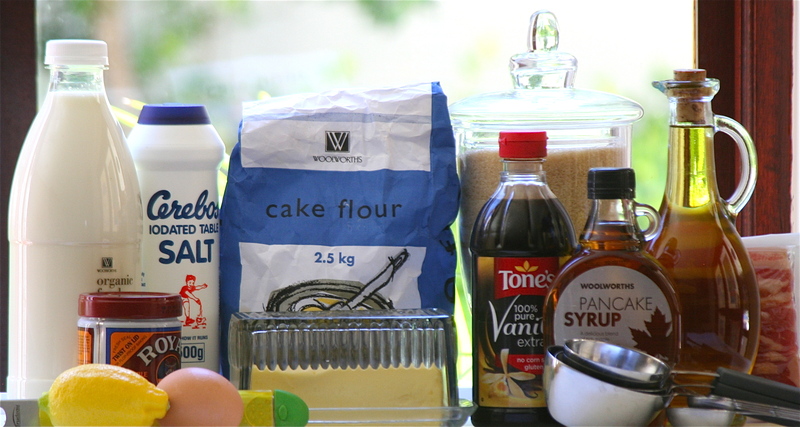 Once you mix the ingredients you only have about a 20 minute window to make the pancakes. After that, the baking powder looses its ability to rise. Using a 60ml (1/4 cup) measuring cup, pour batter into prepared pan. Use side of measuring cup to coax a circle. When bubbles appear on the surface it’s time to flip. 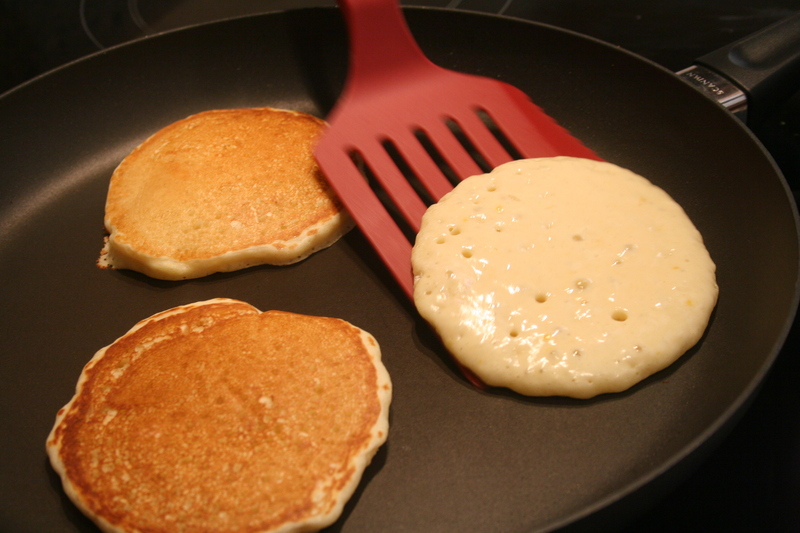 Use a large spatula to slide under the pancake and then flip. Just keep flipping. You will be a pro in no time. Pancakes freeze beautifully. Takes a minute in the micro and you have a breakfast treat mid week. 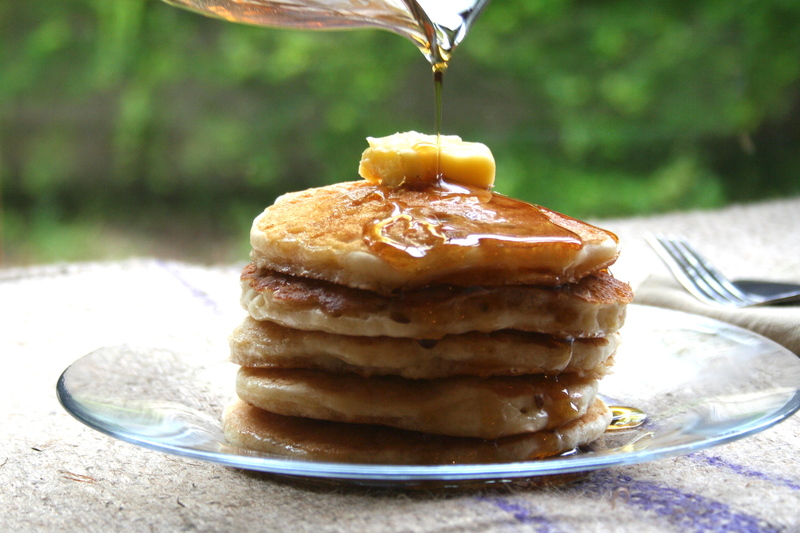 Slather with butter and drown in syrup. Now that is the beginning of a real American breakfast!! I adapted this recipe from a recipe from a lemon blueberry pancake recipe. But, I have noted my changes. I am calling these pancakes American to differentiate from the more common French pancakes that are so common here. I am not calling them lemon pancakes in spite of the recipe calling for lemon and lemon zest because one lemon just does not give them true leomony flavor. The tartness of lemon compliments the saltiness of the butter slathered on top and the rich sweetness of the maple syrup bath. 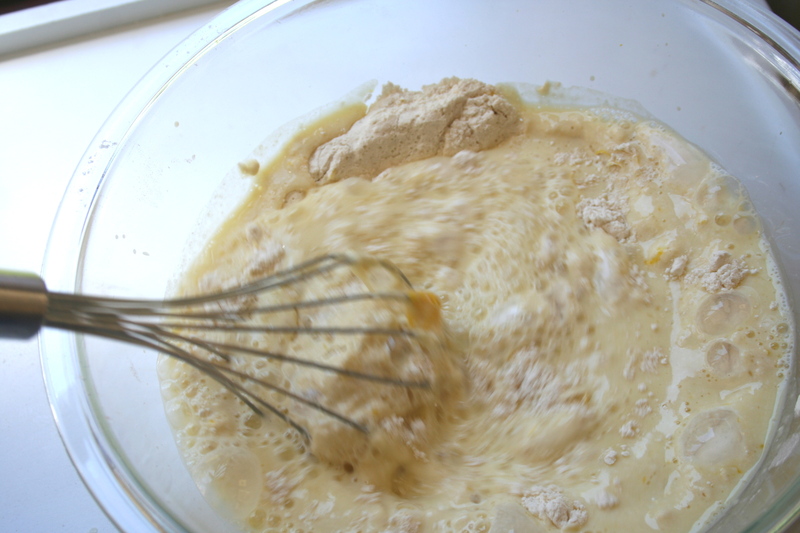 375 milliliters (1 ½ cup) milk (I use low fat) if batter seems overly thick, add a tablespoon or two. 2 Tablespoons Butter, Melted I always forget to add the butter and they come out fine. Zest lemon peel directly into a large mixing bowl. Then add flour, salt, baking powder, and sugar. Set aside. Pour milk into a large (at least two 500 milliliter measuring cup) Juice lemon in the milk. Let sit for 5 minutes. 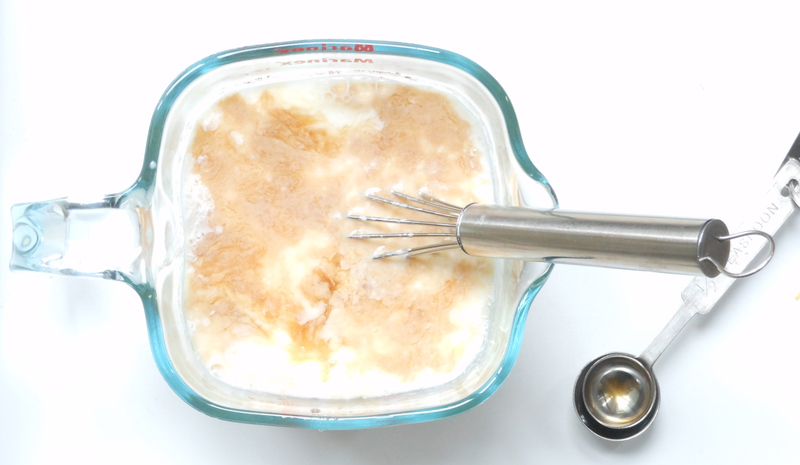 Then add egg, vanilla, and melted butter (optional). Mix to combine. Heat heavy skillet or grill over medium low heat. Coat with oil, then wipe it out with a paper towel so only a thin veneer of oil remains. Drop batter by 60 milliliters (¼ cup ) into pan. Use edge of measuring cup to coax a circle. 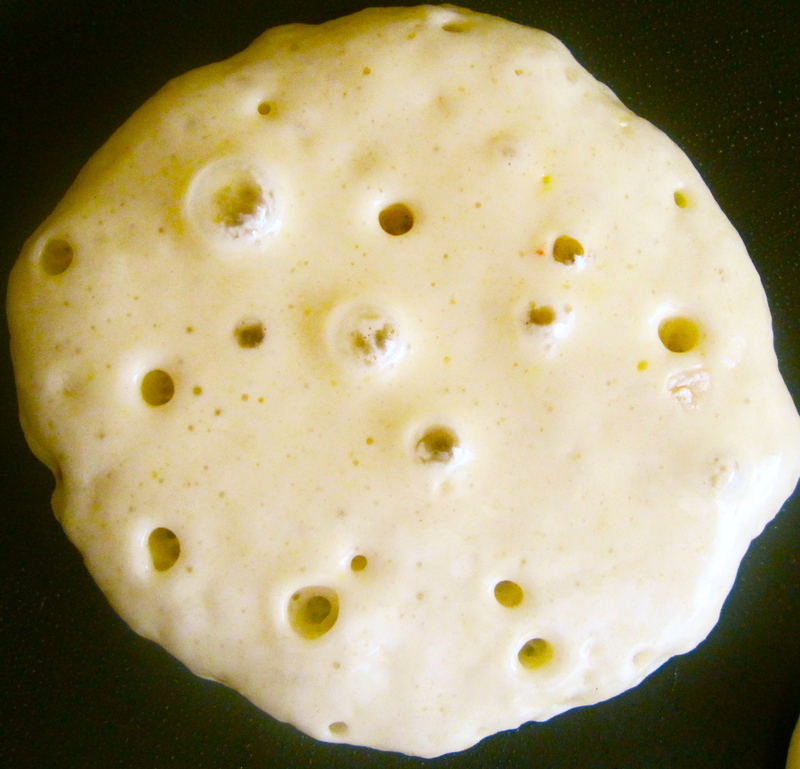 When surface of pancakes bubbles, it is time to flip. 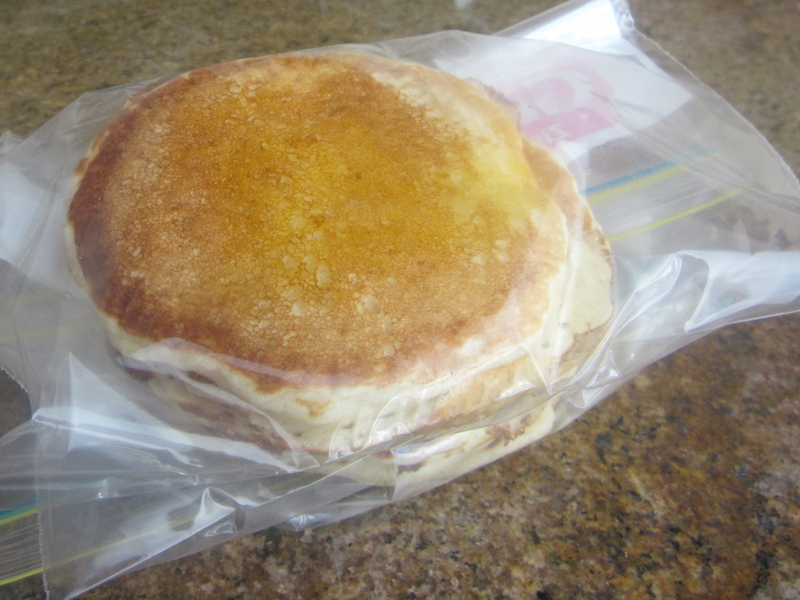 Once, flipped allow a minute or two for bottom to brown. What’s on tap for next week? My daughter’s birthday is coming up – Dec 19th. And she has been asking for an ice cream cake. Both my eyes and my husband’s eyes kind of lit up at the mention of Ice Cream Cake (ICC). For different reasons of course – mine lit up because I thought, ahhhh I can make an ICC. His lit up because he thought ahhhh I can eat an ICC – his predominant food weakness……check back next week for skinny ice cream cake!!! These pancakes look amazing!! I am going to make them tomorrow with the blueberries. The pictures are SO professional, WOW! I am so proud of you Allison! This is great!!! Made the pancakes this AM, Perfect!